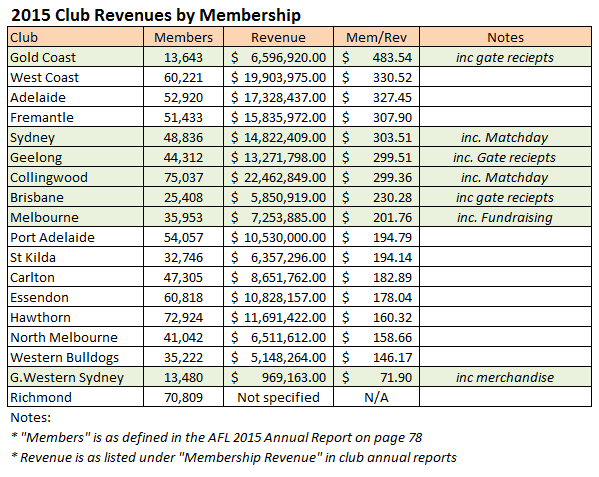 The AFL today released its official membership figures for 2015. In boasting a record membership, the Swans were joined by the Hawks (72,924), the Tigers (70,809), Essendon (60,818), West Coast (60,221), Port Adelaide (54,057), Fremantle (51,433), Geelong (44,312), North Melbourne (41,012) and the Western Bulldogs (35,222). Expansion clubs Gold Coast (13,643) and Greater Western Sydney (13,480) also experienced natural improvement to record levels, while Melbourne (35,943), St Kilda (32,746) and the Brisbane Lions (25,408) improved on their 2014 figures. The only teams to suffer drops in membership were Adelaide (52,920), Carlton (47,305) and Collingwood (75,037). The overall tally, which was compiled after the July 31 deadline, was 836,136 club members nationally, with an overall increase of 31,656. AFL club membership continued to break records, reaching a total of 836,136 members nationally. This is a growth of 31,656 members (3.93 per cent) from 2014 and again the highest recorded figure in the game’s history. Western Bulldogs were second with an 11.68 per cent increase to 35,222 members and Port Adelaide continued its growth after its move to Adelaide Oval with membership growing to 14,219 members (36 per cent) in just two seasons. Collingwood continues to be the largest-supported club in the competition with a total membership of 75,037, heading a list of eight clubs exceeding 50,000.
churn rates of 3.71 per cent for Full members and 9.3 per cent for Silver members. AFL Membership is made up of 31,017 Full members, 20,469 Silver members and 3270 Absentee members. 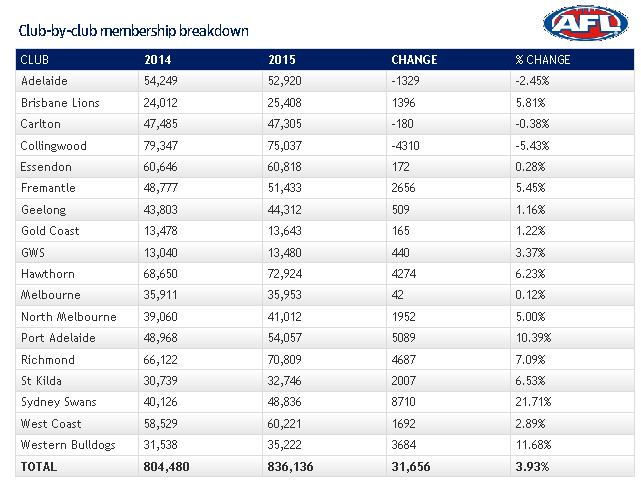 With 49,239 members electing a club of support, AFL Membership accounts for 7.06 per cent of total club access members.